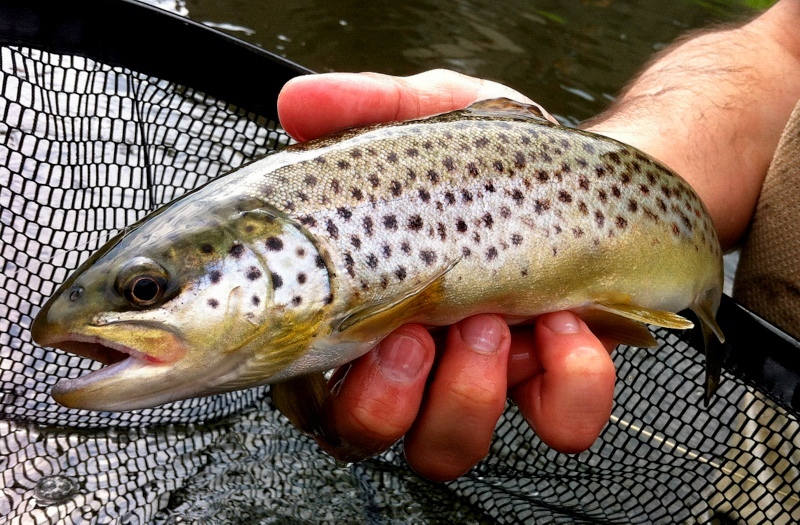 Well the Brook duns are out in force and about time to! I manged to get out on the river for a few hours in the week after a bonkers morning so rang the boss and had the day off and after sorting a load of stuff out i hit the river for a few hours. I knew one of my mates was on the river that day so i made a quick call and met up with him and his butty. when i met them up around 11.30 the flies started to hatch and the day looked quit promising. Finally we caught sight of the brook duns taking off on the stones as we walked the river. In the night we had a fair amount of rain making the river quit cloudy but we knew it would clear over time and i always love fishing the river with a slight colour to it, it can be the best time to look for the larger fish on the move around and with good amounts of brook duns coming down the chances were in are favour :). As the fishing was going nuts i sat there just watching Rob and Adrian catching fish and having great time, we headed up river just using the dries, was plenty of bugging water but bit sick of chucking tungsten and with so many fish rising it was just pointless anyway!. Rob and Adrian took many fish around the 2lb mark.. I didn’t have much time left after that so i had 2 head home to pick my son up from school so the boys followed and all in all it was a wild few hours fishing and was great to see a cracking Brook duns hatch for ones 🙂 Rob below with some of the lovely browns he had! 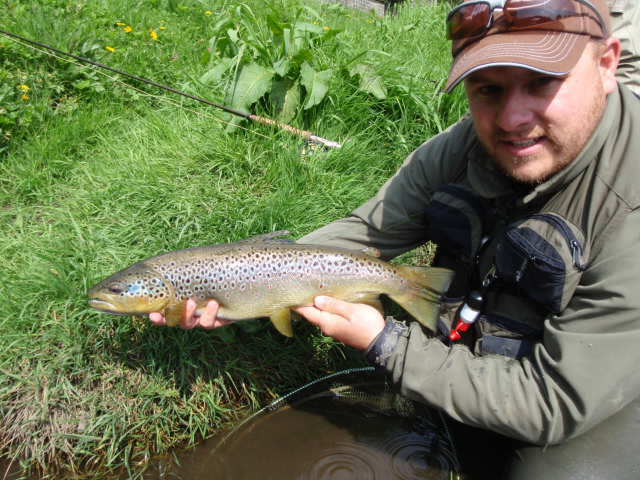 This entry was posted in Fly Tying, Stream fly fishing and tagged Airflo, Brook dun htches, brook duns, brown trout, dries, dry fly fishing, Fishing clothing, fly fishing, south wales, south wales fly fishing, Terry Bromwell, trout, welsh rivers on April 30, 2014 by fishstalker666. 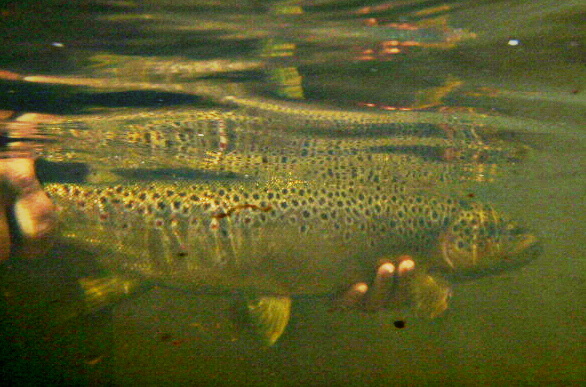 FISHING BRITAIN with Hywel Morgan. 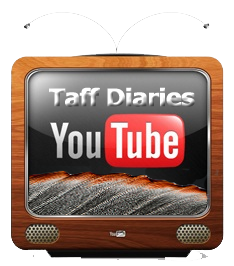 Well a little different guys, had the opportunity to be involved in the show FISHING BRITAIN, presented by Hywel Morgan on the river Taff. 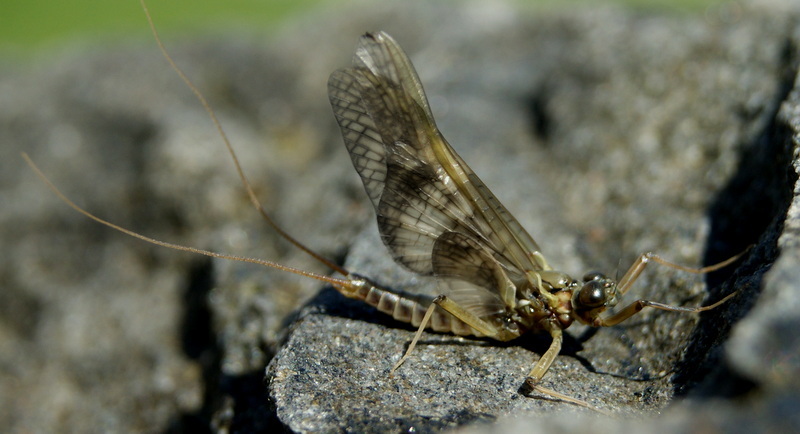 This entry was posted in Fly Tying, River Taff, Video and tagged Airflo, brown trout, Fishing Britain, fly fishing, Hywel Morgan, nymphs, Rhondda Valleys, river taff, south wales, Terry Bromwell on April 17, 2014 by fishstalker666.